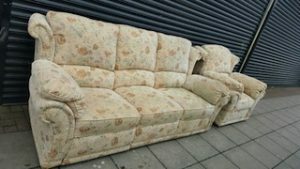 House Clearance Service In Thurcroft Barnsley Barnsley Dinnington Doncaster Hatfield Chesterfield. As well as clearing the usual furniture these small items will also need clearing – A Makita Hp457d cordless drill drive with a 1.3ah battery and charger, A brand new boxed Canary all in one home security device, A brand new Jo Malone Lime, basil and mandarin scented candle, A brand new purple floral patterned Marks & Spencer 100% cotton sateen duvet cover and pillow cases, A Bosch PSR120 12v cordless drill and battery, A pair of tulip decorated Art Nouveau style glass lamp shades, A set of three Towns Folk Lennox christmas figurines. 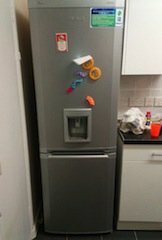 A silver Samsung tall standing fridge freezer, with built in water and ice dispenser. 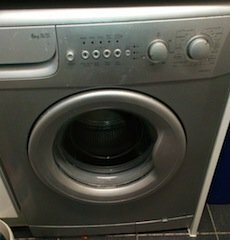 A silver Hotpoint 6kg 1200 spin under counter washing machine. 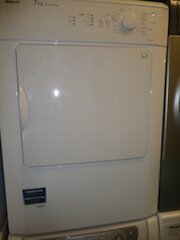 A white 9kg Bosch under counter condenser tumble dryer. 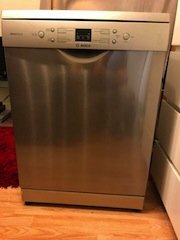 A stainless steel Bosch full size under counter dishwasher. 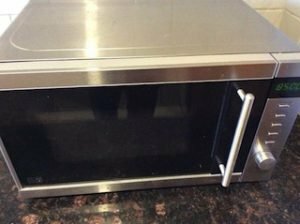 A stainless steel Panasonic 600w microwave oven. 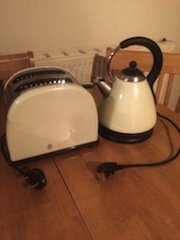 A cream Russell Hobbs two slice toaster, together with the matching cone shaped kettle. 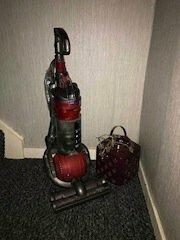 A red and grey Dyson DC50 ball upright vacuum cleaner. 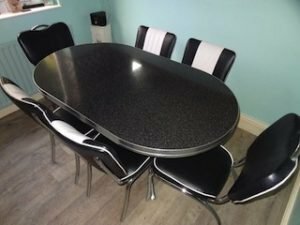 A retro diner style oval dining table, together with six matching faux leather upholstered dining chairs. A vintage three seater high back sofa and matching armchair, upholstered in cream patterned fabric. A high back reclining armchair, upholstered in chocolate brown faux leather. 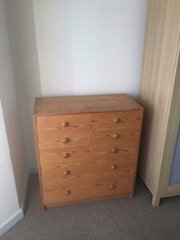 A large solid pine bedroom chest of five drawers. 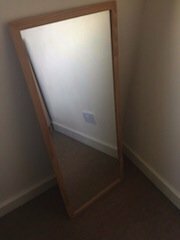 A tall standing solid pine framed floor mirror. 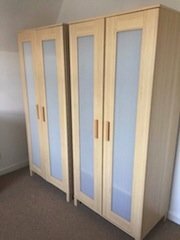 A pair of Ikea beechwood plastic panelled double wardrobes, each with shelves inside. 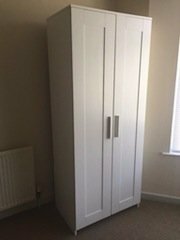 A painted white tall standing solid wood double wardrobe, with two shoe shelves inside. 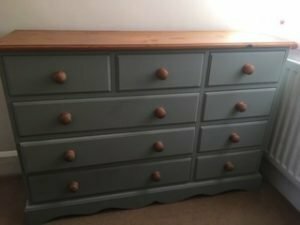 A large painted grey solid pine bedroom chest of drawers, having two small over three large drawers aside four small drawers. 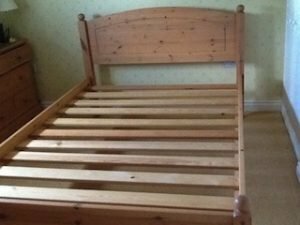 A solid pine king size bed frame.